Examples, solutions, videos, worksheets, games and activities to help Algebra students learn how to graph systems of linear inequalities. The following diagrams show how to graph a system of linear inequalities. 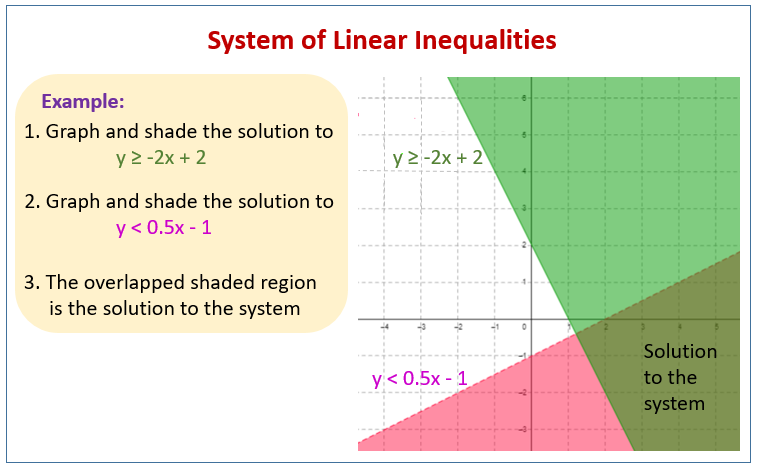 Scroll down the page for more examples and solutions on graphing systems of linear inequalities. 1. Graph and shade the solution to the first linear inequality. 2. Graph and shade the solution to the second linear inequality. 3. The region that is double shaded is the solution to the system. This video demonstrates how to solve a system of inequalities graphically.